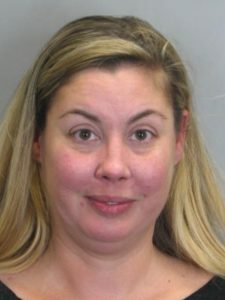 A 40-year-old woman was arrested for drunk driving after police said she hit the cruiser of Fairfax County police chief Edwin C. Roessler Jr. in Centreville last night, giving him minor injuries. Christie A. Edgar of Centreville was taken into police custody and charged with driving while intoxicated following the collision at Lee Highway and Stone Road about 8:40 p.m. Monday. The chief was stopped at a red light in his unmarked 2017 Ford Explorer when authorities said the woman rear-ended him with her Nissan sport utility vehicle. Roessler was brought to a local hospital for treatment and released late last night. He was back at work this morning.